We have some friends coming over tomorrow evening and I thought these would be cute to have out for them to indulge in. These would be cute to make for a baby shower also, because of the pastels. I might even just go with one color egg or candy for 'boy' or 'girl' theme. The recipe I got this idea from used Nutella in the middle but I didn't have any on hand and I like chocolate better so I used some good quality that I had. 1. Preheat oven to 325F. Line a large baking sheet with parchment paper or a Silpat mat. 2. In a large bowl, stir together the sweetened condensed milk, egg white, vanilla extract and salt. Stir until combined. Add in the coconut and mix well. 3. With a spoon, scoop up about 2 Tablespoons of the dough and place the dough onto the prepared baking sheet. 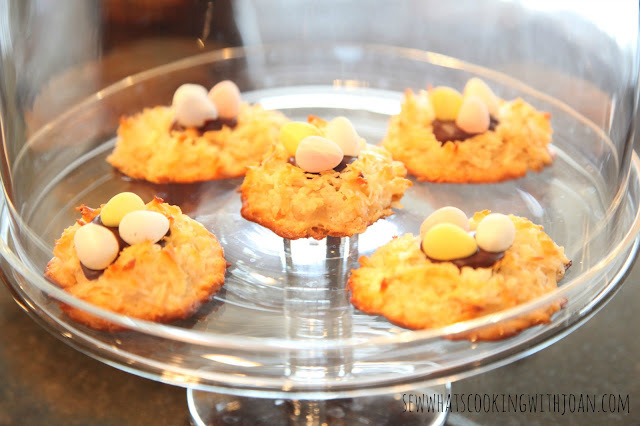 Form the cookies into the shape of a bird nest by pressing down in the center with your thumb. 4. Bake cookies for 17-20 minutes, or until slightly golden brown. Remove from the oven and press your thumb down in the center of the nests again. Cool the cookies on the baking sheets for about 5 minutes or until they are cool and set. Remove with a spatula onto a cooling rack. Cool completely. 5. Place about a tablespoon of melted chocolate in the center of each nest. Place 3 egg candies in the center of the nest. Finish decorating the nests and serve. Note -you can make these 2-3 days in advance and just place them in an airtight Tupperware container on the counter. If you guys have some other cute ideas for Easter sweets or DIY projects, send us pictures...we would love to see them! 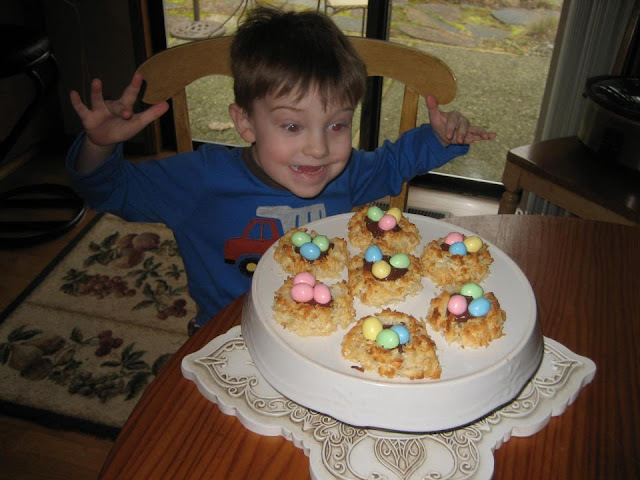 Over the weekend Fawn and Grandson, Liam made the nests! Just had to post this!! So cute! These look so cute! I can't wait to try them! I am not a big fan of Nutella, I like the pure chocolate version! These are adorable. 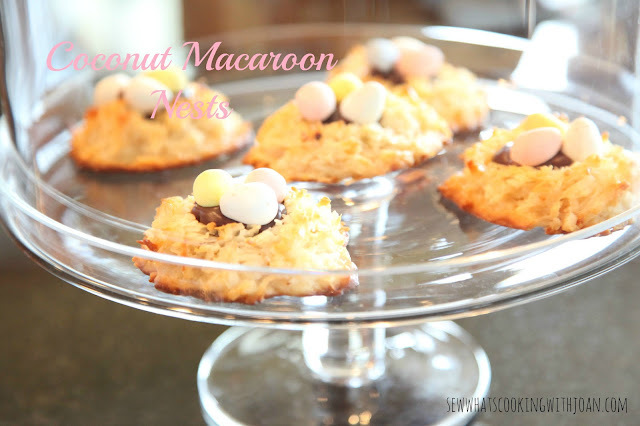 And I love coconut macaroons, so I've got to try making these! 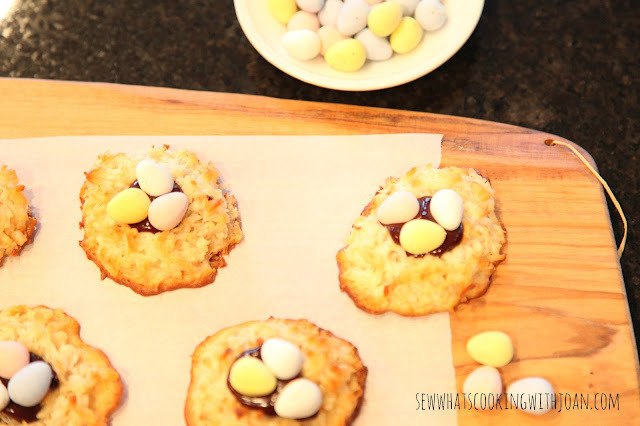 This recipe is easy & fun making them with my grandson... plus they're delicious! I used pure dark chocolate chips instead of Nutella. I love macaroons but these nests with the little bit of chocolate are "Yummy"!